This cursor blinks its steady pulse: birth pangs of the universe. Once we were a void. Once we were beautiful. Where once a beautiful void, big rigs now knife down the interstate between frosted hills, under a blue period, a finality I cannot dispute, redistributing the future without you. When we read books together, we would wear the author’s skin for a time. The fresh scars, the humility, the beauty. Their story became our story. For weeks after Maggie Nelson’s ‘Bluets,’ blue dealt blows to the senses, it intoxicated. It made me question my relationhip with the world around me, and made you question your relationship with the world within you. Humans have difficulty understanding evolution, difficulty understanding what we do not see. We do not see slowly moving changes to our world. When I looked at you, through you, you became more haze than you. Each day you became more blue. Each day the hue deepened, and soon you were a fossil to record, a footprint to cast, only our words left tripping over snow-falling asterisks on blue screen, lost. This cursor still blinks steadily: product of an event beyond our control. 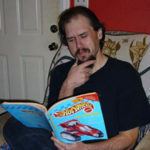 Ron Gibson, Jr. has previously appeared in Noble / Gas Quarterly, Pidgeonholes, Maudlin House, The Vignette Review, Ghost City Review, Cease Cows, Spelk Fiction, Ink in Thirds, Gravel Magazine, etc. And can be found on Twitter at @sirabsurd.